Drama is probably the best way to describe the Australian Grand Prix 2017. 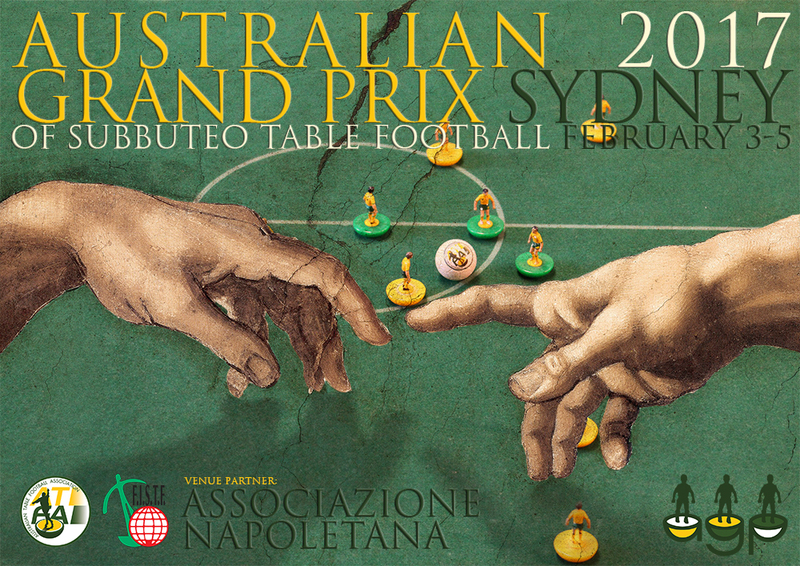 A late switch of venue, events during the Open competition, some classic encounters, a female competition for the first time, and the presence of representatives of 11 of our club, combined to make this the most dramatic Australian Grand Prix. The dinner and draw on the Friday night, so ably MC’d by Geoff Sirmai, and catered brilliantly by our own Fabrizio Coco, resulted in some fascinating pairings in the groups of the Open. In Group 1, Peter Thomas (MTFC) dominated, but one of the two Cherrybrook ‘prodigal sons’ — Nick Brill raised lots of eyebrows with his comeback performance after 20 years out of competition. In his first up match, using Toccers he faced Peter and came away with a credible 6-2 loss, before smacking Kosta Barbaris (Sydney) 6-0. 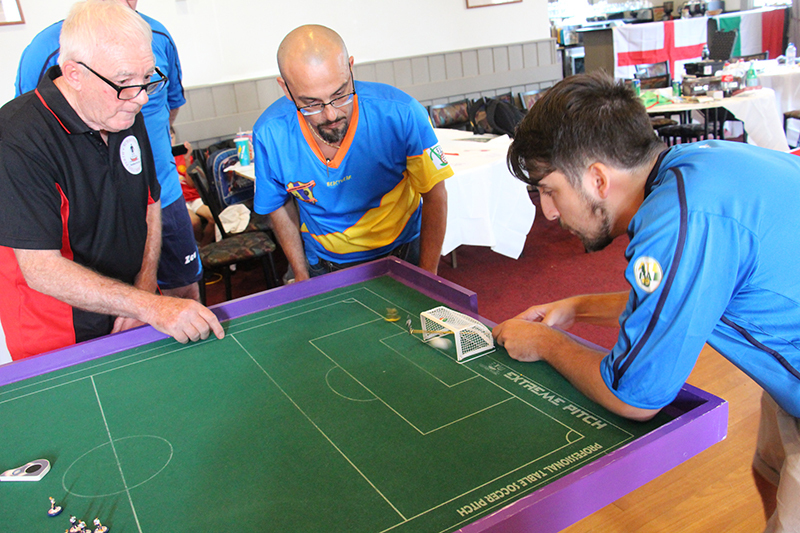 In Group 2 there was a big surprise when Giuseppe Tardiota (Brisbane) beat Eliot Kennedy (Falcons) 1-0. 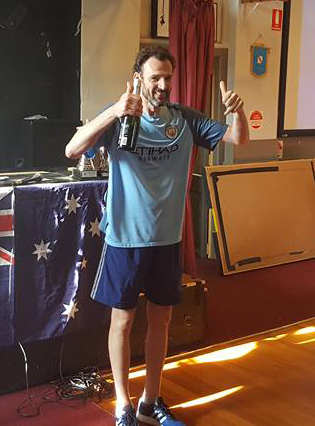 Yago Dzelalija (Canberra) made his ATFA debut, getting a credible 1-1 draw against Giuseppe, and a 0-0 with Jeremy Simpson (Hipfingerz) before succumbing to the raw power of Eliot 5-0. In Group 3, Ross McNulty (Perth) threw caution to the wind in his opener against Steve Dettre (Falcons), and despite Steve twice taking the lead, Ross pegged him back — the second being an absolute screamer. But in the second half, Steve’s accuracy wore Ross down, scoring three unanswered goals. Fabrizio won the group after a 1-0 win against Steve. Group 4 featured the bravest individual of the weekend. Despite suffering from the effects of a brain tumour, Harley Ullrich (Falcons) turned up on both Friday night and Saturday: “I wasn’t going to let anyone down. People were expecting to play, and I was going to be there.” He lost 3-0 to Benny Ng (MTFC) and then 2-0 to Rik Bland (Brisbane) before sharing the spoils in a pulsating 3-3 draw with Tony Credentino (Sydney). Benji Batten (MTFC) made a spirited start to his title campaign with three wins in Group 5, ahead of Jon Ball (Falcons), another debutante in Terry Koutzas (Sydney) and Chris Thorn (Perth). Hermann Kruse (Falcons) caused a boilover in Group 6, topping the table after playing some of the best table football he’s shown in the last two years. 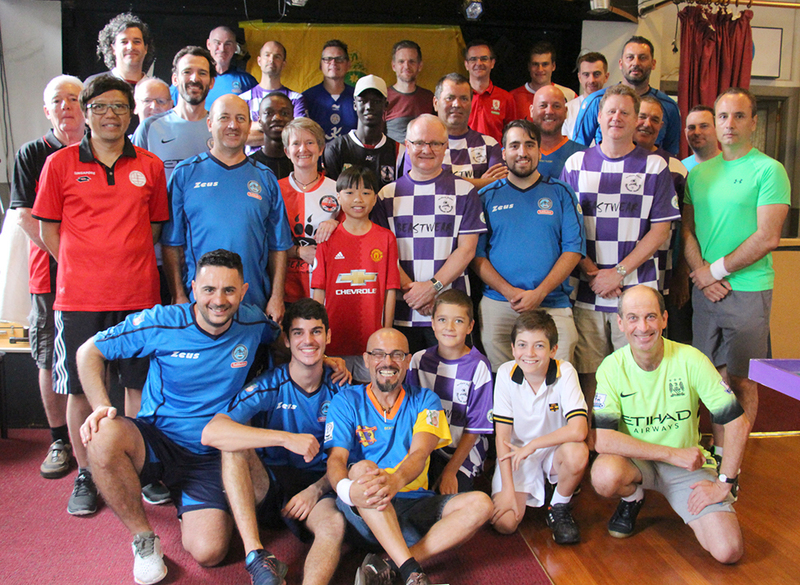 He held Adrian Elmer (Parramatta) 0-0, then Todd Giles (Newcastle) 1-1, before whipping three past another returnee, Richard Wilson (Cherrybrook). Todd had quite literally come straight off the boat, after a night shift in the navy, but lack of match practice took its toll. In Group G, Paul Mercer (MTFC) topped the table, with Hugh Best (Perth) squeezing through in second place. The barrage round threw up some of the biggest scores of the weekend. Rik could do no wrong as he beat Hermann 5-1, while Fabrizio went on a rampage against Jon, winning 5-0, and Benny beat Hugh 6-0. But the big surprise was Steve’s 7-1 thumping of Giuseppe, with every shot being an unstoppable meteor. Nick caused the biggest boilover when he beat Paul Mercer 2-0 to progress to the quarters. Peter Thomas threw everything at Steve in the first half of their Quarter Final clash, with only Steve’s goalkeeping forcing him into the match. In the second half, a lightning attack by Pete broke the deadlock, and we progressed with a 2-0 win. Eternal rivals Benji and Benny faced off in their quarter, with Benji loudly proclaiming his 2-1 victory in a controversial climax to the game! Fabrizio comfortably moved past Rik 3-0, but Eliot had to battle all the way to sudden death extra time — at one stage being down 0-2 — before he could beat Nick 3-2. In the Semi-finals, Eliot seemed to be inspired — or maybe just spurred into action — and put on a great performance to beat Fabrizio, while Peter turned on the style to beat Benji 3-0. In the final, some unbelievable defensive flicks from both players kept the game scoreless until Peter wove his magic to claim his second AGP in three years. This entry was posted in News, Tournament reports and tagged 2017 australian grand prix, fistf, peter thomas on 06/03/2017 by ajebec. 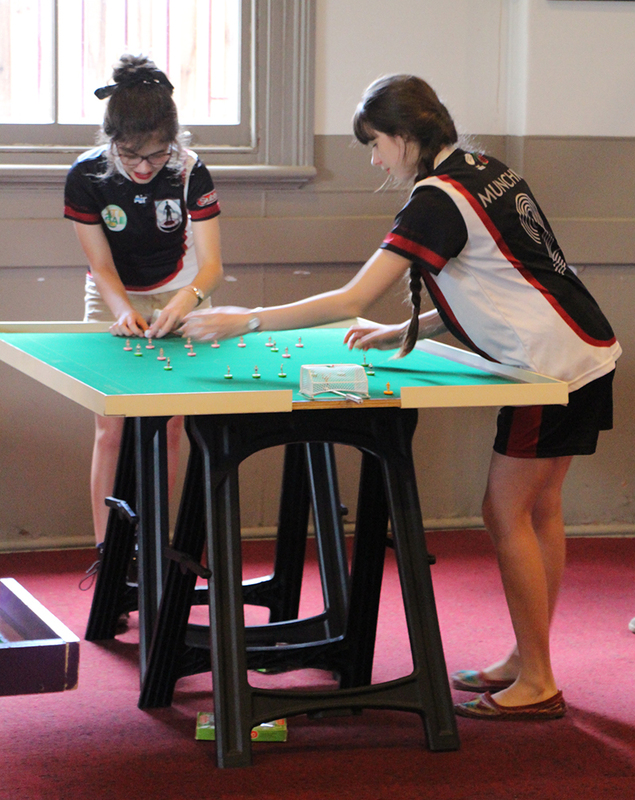 After the drama of the knockout stages in the AGP17 the 3rd and 4th players in the group of four advanced into a WASPA Knockout Tournament that ran alongside the Knockout stages of the AGP17. In a thrilling competition full of incidents and some truly special goals Mcnulty clinched victory to head 4,000 miles back to Perth with another title in the bag. In the first of 2 Elimination play offs to make the Quarter Final Chris Thorn turned on a spectacular display too dispose of local junior, Andrew Kuany, in emphatic style with a 3-0 win. In the 2nd Elimination Play Off Yago Dzezlalija also put on a superb display in a 3-0 win against another local junior, Othniel Antwi, in a gripping match that really showcased the beauty of Subbuteo in its finest essence. 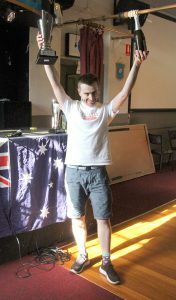 In the first of the Quarter Finals Ross Mcnulty came up against Jeremy Simpson and his dangerous Leicester City Tokas. After an even start, Mcnulty began to dominate play and took the lead just before half time. Simpson tried his all and cannoned a shot against the post but Mcnulty broke quickly and rasped a fine strike past the helpless keeper to go 2 up with 5mins left. Simpson did his all but could not break down the organised defence of Mcnulty’s Manchester City Tcha Arrows team and another goal was added to complete his advance into the Semi Finals. Chris Thorn took on Kostas Barbaris In the 2nd game of the Quarter finals and yet again remained water tight at the back. The veteran 74yr old dominated and took the lead just before half time with a wonderfully constructed goal of sheer patience that paid off. In the second half Kostas put Thorn under pressure but could not break down the defence and half way through the half Thorn added another beauty to join his club mate Mcnulty in the Semi Finals. 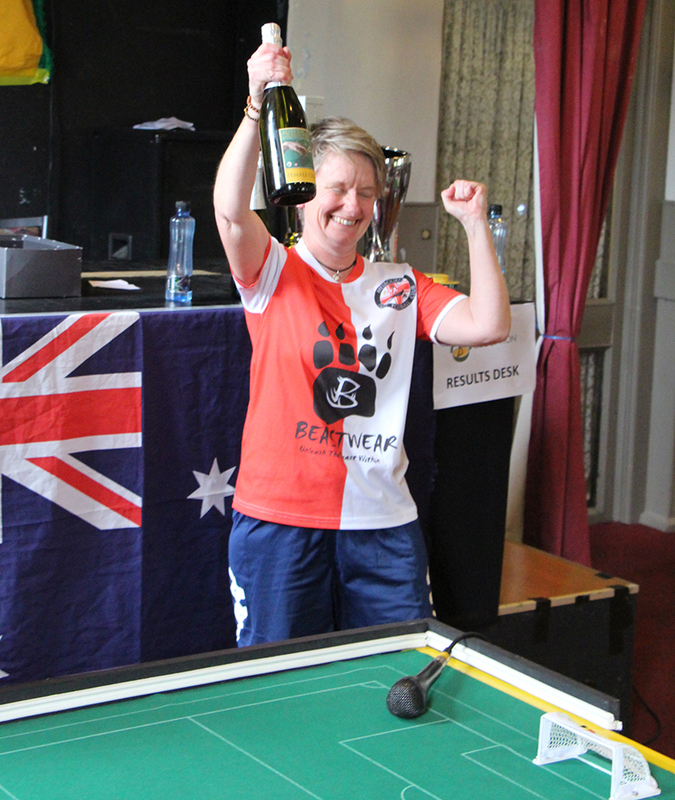 In the 3rd game of the Quarter Finals, local Greek-Australian lad, Terry Koutzas, faced Melbourne girl and current Ladies No 1, Beth Eveleigh. Again another very tight match was played out with Beth remaining extremely organised at the back and they headed into half time at 0-0. 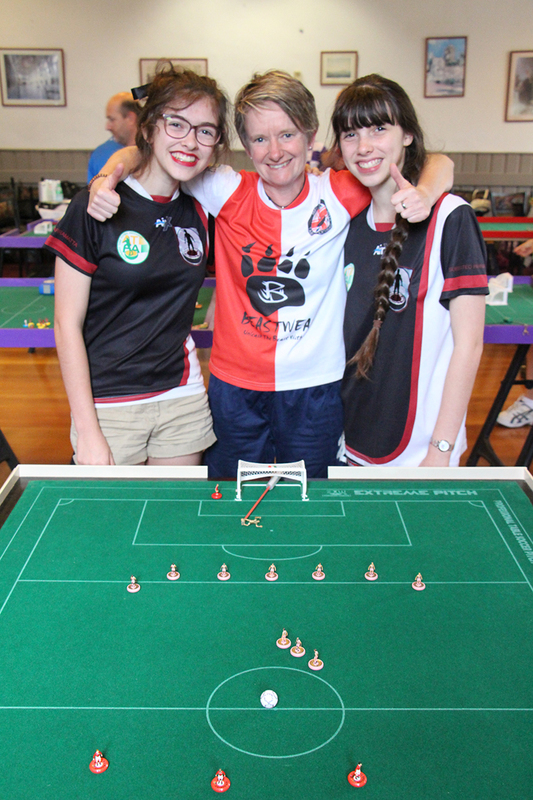 Koutzas finally broke away after a sustained period of pressure midway through the second half and although Beth rallied she could not equalize, Koutzas advancing into the Semi Finals. In the 4th and final Quarter Final Richard Wilson was pitted against Yago Dzelalija and another classic encounter was evident with the first half ending 0-0 with each player going close on numerous occasions. In the 2nd half, Wilson and his dangerous Tokas smashed in an unstoppable shot that nearly took the net out and Yago crashed out after such a valiant effort in another cracker. The first Semi Final pitted Chris Thorn against the local Terry Koutzas and after both defences were so organised the game headed into extra time, again they could not be separated and the game headed into shots. After the required 5 shots each, scores were tied at 3 each, so they went into sudden death. Thorn missed his first and Koutzas made no mistake to propel himself into the Final and deny Thorn of a possible show down with other Perth local Mcnulty. In the 2nd Semi Final Mcnulty faced Richard Wilson and his ever dangerous Tokas and after a fine quick counter attack a shot was placed into the top corner from the right too put him 1 up at half time. Wilson really went for it in the 2nd half and duly snatched a deserved equalizer with minutes left on the clock after a great strike. Into extra time and again it remained deadlocked at 1-1 and so the 2nd Semi Final was to be decided on penalties. At 2-2 after 4 penalties each Mcnulty tucked away his 5th and Wilson missed to go out after such a terrific display in the tournament. The Final was a game littered with quick break aways and tight defensive discipline between Mcnulty & Koutzas but ultimately Mcnulty began to break down The Sydney TFC player and went in 1 up at the break. In the 2nd half Koutzas attempted to get back on level terms but a second and final killer goal landed Mcnulty his first title away from Perth. 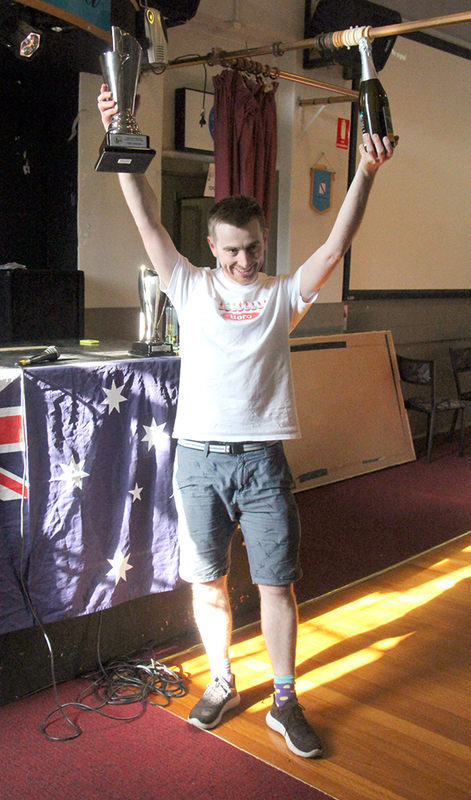 This entry was posted in News, Tournament reports and tagged 2017 australian grand prix, tournament report, waspa tournament on 25/02/2017 by ajebec.